There are about 76 units over 9 floors, built in 2002. Ocean Grande residents enjoy the benefit of a 24 hour dedicated front desk attendant, security and valet, oceanfront swimming pool, a fitness center, sauna and steam room, club room and billiards room and this a pet friendly building. To drive there, take Hillsboro Blvd East to A1A, make a right. Head south for about 2 miles, Ocean Grande will be on the left hand side (ocean side). Learn more about what makes Ocean Grande an exceptional place to live, or browse through some of our listings below. 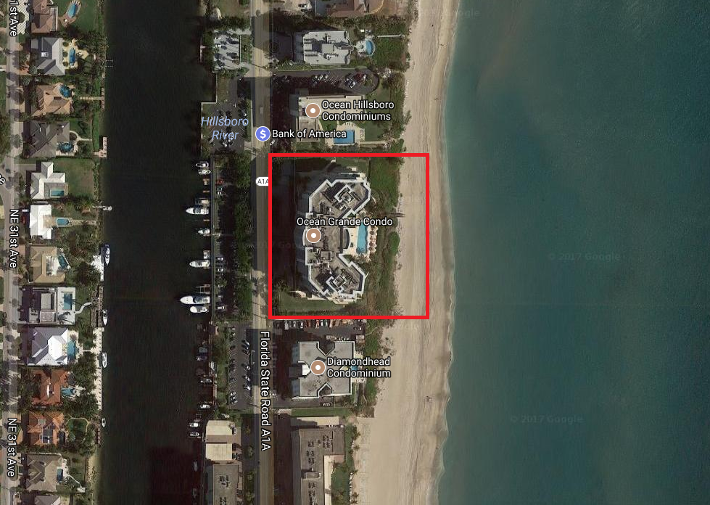 Ocean Grande community is situated in the heart of the prestigious Hillsboro Mile, home to Ocean-to-Intracoastal mega mansions including the well known Le Palais Royal, a $159 million property. Ocean Grande is also an Ocean-to-Intracoastal property, featuring a private resident marina and a dog park. Contact us today to make Ocean Grande your new home!